Story & Photos by Tony Bruguiere | Ft. Collins, Colo. The Custer State Park Buffalo Round Up is a tremendously successful and popular tourist event. It provides economic impact to the State of South Dakota and the City of Custer. The Round Up brings world-wide attention to Custer State Park but, to the park personnel, the Round Up is primarily a range management tool. Pressures from over hunting in the late 1800s and loss of habitat that continues to this day came very close to causing the extinction of the American Bison or Buffalo. In the early 1900s a number of forward-looking individuals captured some of the very few remaining buffalo in North America and put them in game preserves or large ranches where they were allowed to range freely. What is now Custer State Park in South Dakota was one of these early game preserves. The original 36 buffalo in 1914 grew to over 2,500 by the 1940s. It was obvious to Park personnel that 20,000 acres of grassland could not support the growing number of buffalo and elk that depended on the grass. A range management plan would have to be implemented. To reduce the number of individuals by selling live animals was out of the question because the 1940 buffalo herd was infected with Brucellosis abortus. Brucellosis is a pathogen that causes aborted births in bison, elk and cattle. 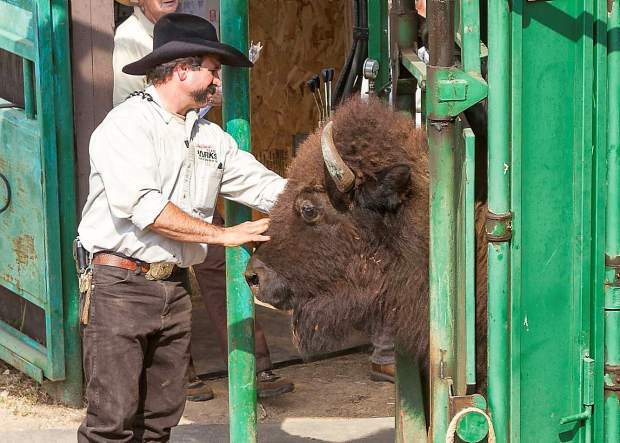 The first step in managing the Custer buffalo herd was to have it certified Brucellosis free. Live animals could not be sold, but processed meat could. "The park had built a meat processing plant. 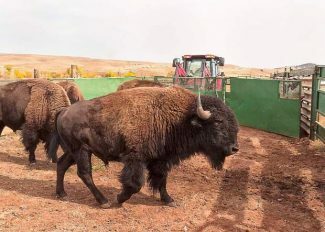 Park rangers and herdsmen would go out and harvest buffalo and elk, and the park processed the meat and sold buffalo and elk meat wholesale," said Gary Brundige, Resource Program Manager for Custer State Park. "The park continued to operate that plant until 1974, so there was a period of time when we were both selling live buffalo, as well as continuing to sell processed meat." 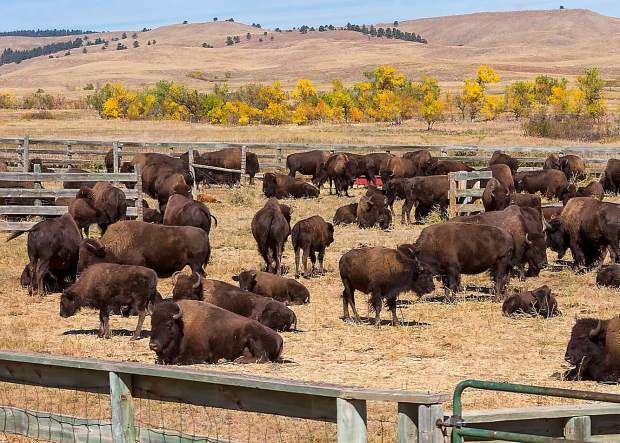 In 1966 the herd was certified to be Brucellosis free and Custer State Park began selling buffalo at auction as a means of reducing their herd to levels that the land could sustain and also to provide breeding stock to buffalo ranches. 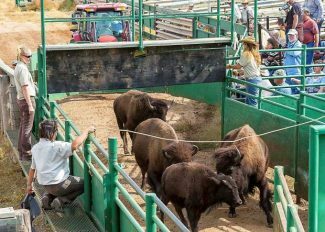 Custer State Park has been selling live buffalo for 47 years and averages between 300 and 400 head a year. Buffalo are being raised on private ranches across the country and the numbers are back up to about a quarter of a million. However, buffalo ranching is not for everyone and there are some significant issues associated with raising buffalo that have to be considered. Anyone, whether they are visitors to Custer State Park or ranchers working their own animals, that comes in contact with buffalo has to realize that they are dealing with a wild animal. 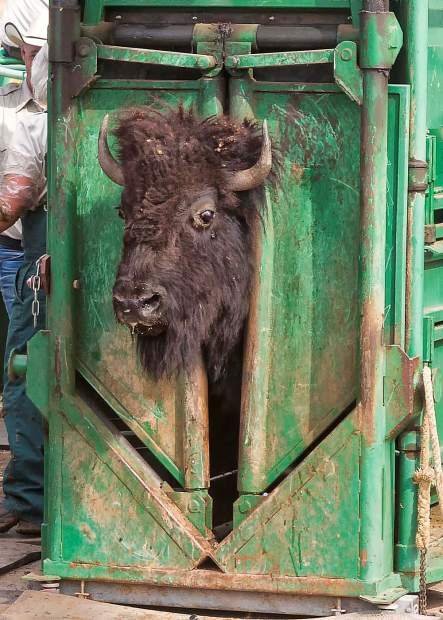 Buffalo may be confined but they are not domesticated. 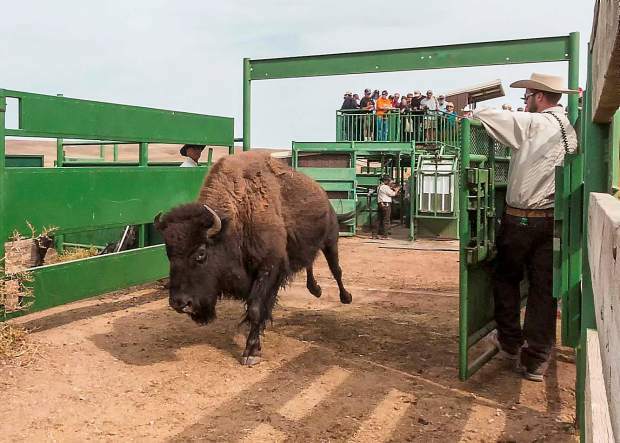 If they decide to do it, buffalo can simply walk through a three strand barbed wire fence. They are agile, fast and powerful and they are also totally unpredictable. All of this means that buffalo demand a tremendous amount of respect. 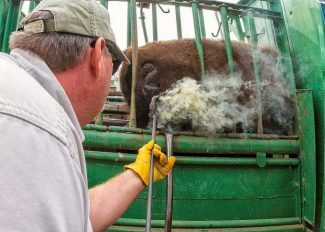 They require strong pens designed for handling buffalo and different methods for moving and working them than those that are used for cattle. "We have to be careful in terms of animals injuring each other in those close quarters, especially when you get those older bulls in there. They move faster and the equipment needs to be significantly stronger because they are going to hit stuff harder and bang around quite a bit," said Brundige. 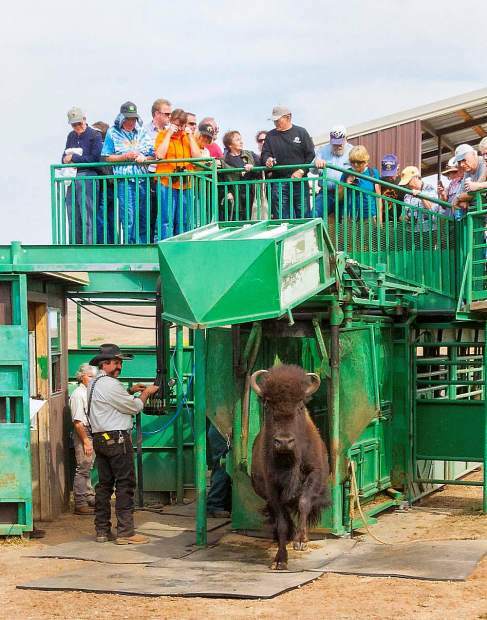 For safety reasons, horses and people are not in the pens when buffalo are being worked. To prevent the animals from injuring each other, small groups are moved and worked at a time. A tractor with a moveable fence slowly pushes the buffalo down a raceway that necks down to an area where calves are separated from adults. Calves are sent to a traditional V-shaped squeeze chute where they are branded, get a Brucellosis vaccination and have an ear tattoo. 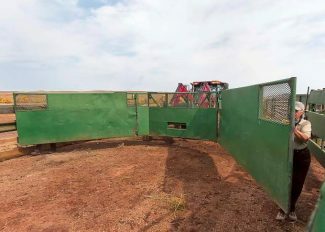 Adults go to a specially designed squeeze chute that is very stout, has high vertical walls and an enclosed crash gate. Females are preg checked by CSU graduate Dr. Sheila Lindsay, and dry cows are routed to the auction herd. 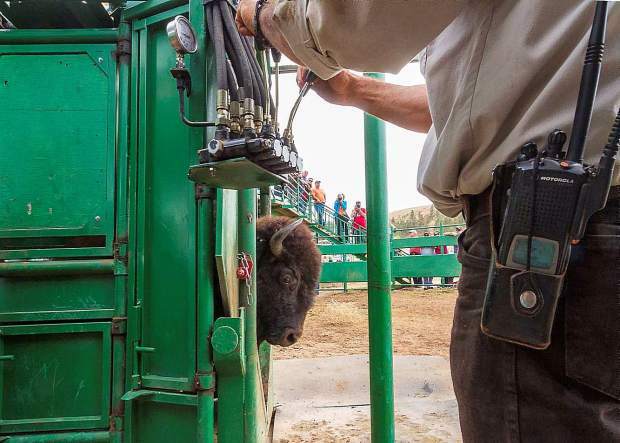 The ear tattoos of males are checked to determine if they are scheduled for auction. A week prior to the Buffalo Round Up about 150 buffalo are rounded up and held in the corrals. After the Round Up these animals are sorted, branded and checked by the vet. Visitors really enjoy being this close to the action. The rest of the herd is given a week to get over the stress event of the Round Up before they are worked. Without all the visitors around the park personnel can work through the herd at the rate of about 250 animals a day. The replacement breeding stock for the herd consists of 2-year-old bulls. Bulls over two are never handled or intentionally part of the Round Up. At this stage they are just too big and pose a danger to other animals as well as to humans. Bulls are very rough on each other during the rut and wear and tear usually limits their breeding potential to about 10-years-old. They also become even more unpredictable at this age and pose an increased risk to park visitors. To remove these old bulls from the herd, Custer State Park issues a very limited number of Trophy Hunting Permits. All of the money generated from the auction and trophy hunts goes back into maintaining the park. 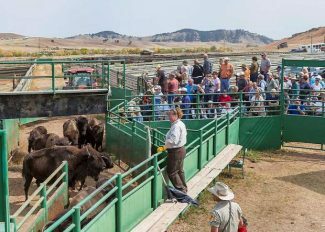 The methods for working with buffalo and the model of range management developed by Custer State Park have become an industry standard.